Back in the 80’s we had the Just Say No anti-drug messages. Does it surprise anyone else that the one they asked Marvel to lead this fight is also a popular superhero only because he took drugs willingly to gain his super powers? That’s right, Captain America who only has super powers because he took souped up steroids basically was the Marvel poster child for not doing drugs. It’s like Bruce Banner saying Atomic Energy and particles are super safe! Could you get any more backwards? I think not and while I love Cap this is one thing about his character that has always bugged me. 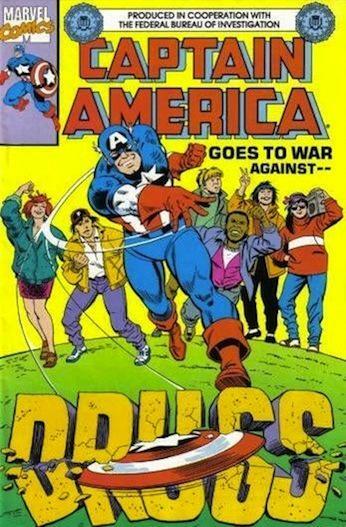 Yeah, that was always pretty funny to see Captain America harping against drugs. What’s next, Cap rails against peformance-enhancing drugs? On a related note, I enjoyed DC’s New Teen Titans anti-drug issue (I think it was sponsored by Nabisco). They couldn’t use Robin for some convoluted reason (licensing maybe) so they created a character named the Protector. The regular Titans’ book profiling the problem of teen runaways was good too. Okay you know to be honest I actually missed that point out! It never dawned on me to see things that way. Come to think you really have made a valid point regarding Captain America, if you think about it would definitely be hypocritical in their part. I guess this is something they have look into or someone has to raise it up to the creators if they aren’t aware about this point haha!